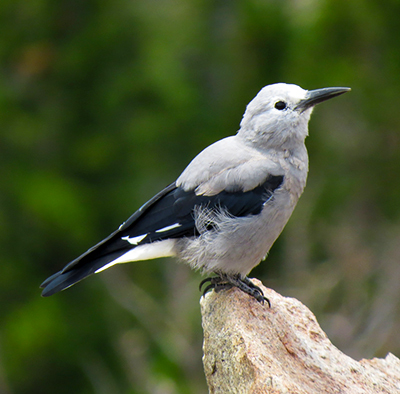 Clark's Nutcracker gets its food by cracking nuts from pine trees. It has a strong bill to pry open the cones of trees and remove the nuts. During warm months, when food is abundant, it hides nuts throughout the forest as a reserve for hungry times. It stores at least 30,000 nuts each year. A squirrel hides nuts in a few locations. This bird hides them in at least 5000 locations. That way if one reserve is stolen by, say, a bear, there are plenty of nuts left. 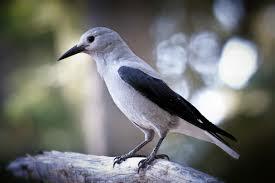 The bird is able to remember the locations of about 75 percent of its reserves. Does it forget about the rest 25%? Or it deliberately doesn't collect them? Interestingly, every year, it collects 25% more nuts than it needs. Maybe it's a reserve on top of a reserve, in case of an especially harsh winter. Interestingly also, the pine tree's reproduction needs 25% of the nuts left in the ground, or it would not survive. So the bird needs the tree to survive, and the tree needs the bird to survive. That is one of the numerous examples of interdependence in nature. One and the other had to be created at the same time. And the size of that brain that could store so much information... we're only beginning to reproduce memory chips that are that small. And isn't there a lot we can learn from this bird? Think about reserves for the lean times. And don't put your reserves in one location. That's good money advice. Fothergill, Alastair. Planet Earth as You've Never Seen It before. Berkeley: U of California, 2006. Print.